After a few hold ups, as well as a desire to explore the outer atolls of the Marshalls we decided to stay here for the South Pacific cyclone season instead of sailing across Micronesia to the Philippines. This has changed our plans for 2014 – although talking to other yachts such route changes are relatively common practice. In fact they are really what it’s all about – with no flights to book and the sense of freedom that this life brings such a flexible itinerary becomes possible. * When we arrive back to the boat we will provision and head back to the South Pacific – direct to either Vanuatu or the Solomon Islands. * Here we’d like to link up to a group called Oceanswatch who do work to protect the coral reefs in the area, as well as a few other community projects. * From the Solomons we’ll either head through PNG or Aus/Indo to the Philippines. Although given the timing the former is more likely. Of course as always the above plan is subject to changes but this is the best we can come up with at the moment. We’re excited about the prospect of more time on the water and new experiences in the countries mentioned. Ever day we can’t believe how lucky we are to be living like this. Each morning swim invigorates not only body but soul. When what was once a dream, turns into a reality, life is sweet, and we are savouring every minute of this sweetness. Looks like we’re sticking with the plan – in July we’ll meet with Oceans watch in the Tetemotu province, Solomon Islands. After 1-2 months volunteering with Oceanswatch we’ll head to the Louisiade archipelago in PNG, popular with Australian boats, and rumoured to be an amazing place to kite surf. Very much excited. The picture below shows our itinerary for the upcoming journey. So far we’ve sailed from New Zealand to Tonga, and then Tonga to Fiji. We are looking at the trip in two stages .. 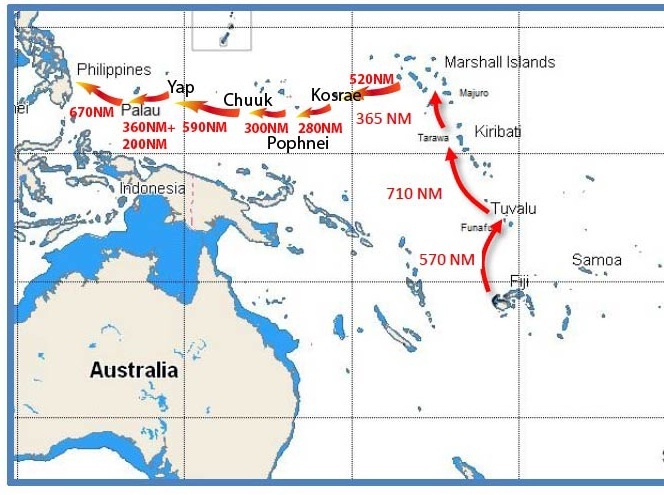 Stage 1 – Fiji – Marshall Islands, and if we’re still keen to keep sailing Stage 2 – Marshall Islands to Philippines. When we left New Zealand we weren’t sure how we would feel about life on the water, but we feel great and are excited about the upcoming trip through some lesser known parts of the world. We have heard of at least 3 other boats heading to the Marshalls and met a lovely couple that have probably already started their trip north. Bring it on. Life is incredible.